In case you didn't think the World of Warcraft commemorative beer steins were ridiculous enough already, the "Legendary" editions may change your mind. It really would have been nice to be in the meeting where the people in charge of merchandising at Blizzard decided to go with commemorative beer steins to market to the World of Warcraft devotees. The reasoning does seem to elude me - what discussion could have possibly led to that? "Well, we could offer commemorative plates, but we find that our subscribers really love beer, so let's go with the steins instead!" Whatever their reasoning, it turns out that the steins were actually kind of cool, and come in four standard flavors: Horde, Alliance, Lich King, and the Dragonflights (as well as the actually-useable Tankard O' Terror replica). I've actually got one on my desk here at work - it's the Horde version, because while I'm an Alliance diehard, I have to admit it just looks better - that you can barely make out in the top-right corner behind the giant robot. But in case you didn't think that the "Epic" edition steins were over-the-top enough, Blizzard has just introduced the "Legendary" editions thereof to go on sale March 2010. For the moment, there are only Legendary versions of the original Horde and Alliance steins, but that may change in the future. The artwork seems the same, which unfortunately means that the Horde one still looks way cooler than the Alliance one ... so what makes it Legendary? What makes it $100 more expensive than the normal editions? Well, only 999 of each stein will be produced, for one. For another, they'll all be hand-signed by Blizzard artists: The Alliance gets Glenn Rane, and the Horde gets the legendary Samwise Didier - clear Horde favoritism once more. 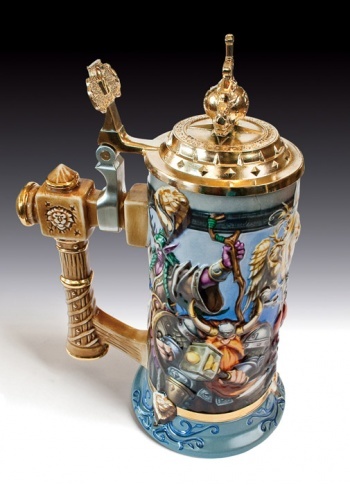 But perhaps the most extravagant part of all is that instead of a pewter lid and plating like the Epic steins, the Legendary versions are trading that boring gray metal in for 18k gold. Yes, you heard me right: These steins have 18k gold lids and trim. Which would go a long way into explaining the $189.99 price, I believe - and yet, you just know that there are some fans who would pay that price in an instant for such a limited edition collectible. On the one hand, these are pretty cool. On the other, I already have a Horde stein and sure as hell ain't shelling out for the "derpity derp" characters on the Alliance one. 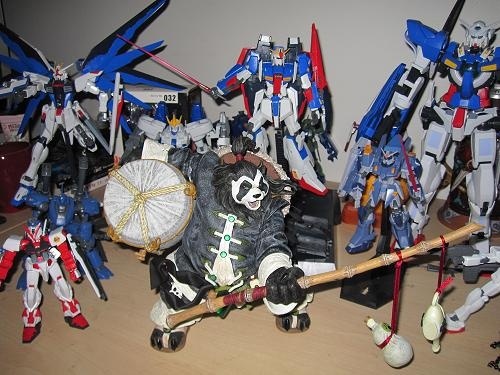 Plus, I have better things to spend $175 on - like giant robot figurines. I'm going to pass on these for now, but if any of you want to try your hand at getting one, go right ahead. Supplies are pretty damn limited, and Warcraft fans can be pretty damn crazy.